Exposing the forces responsible for the loss of trillions of dollars, millions of jobs, massive foreclosures and the disappearance of retirement funds, Plunder: The Crime of Our Time investigates the unregulated fraud and theft that led to the market's collapse in fall 2008. Filmmaker Danny Schechter, Emmy Award-winning former ABC News and CNN producer, explores the epidemic of subprime mortgages, predatory lending, insurance scams, and high-risk hedge funds that caused the collapse of the housing market and a full-scale economic meltdown. Schechter speaks to a range of analysts and insiders about the origins of the crisis: bankers, respected economists, insider experts, convicted white-collar criminal Sam Antar, and top journalists, including New York Times columnist Paul Krugman. In engaging and enraging detail, the film moves from the mysterious collapse of Bear Stearns, an 85-year-old investment film that disappeared in a week, to the shadowy world of trillion-dollar hedge funds, delving into the complicity of major media outlets that failed to sound the alarm or investigate what was going on. In the end, Plunder lays bare the truth behind events that have affected billions of people. A must for economics, business, and sociology courses, as well as anyone who wants to understand the current financial situation. More information and resources available at www.plunderthecrimeofourtime.com. "For the most art, the media has done a lousy job of explaining the recent U.S. economic collapse. How many of us even know what "derivatives" are -- or the crucial role they played in Wall Street's casino-style looting of the economy. That's why this new movie by Danny Schechter, a journalist and documentarian (In Debt We Trust) who specializes in economic issues, is so welcome and valuable. If they [speculators who made giant profits from the fall] are punished, and the much-needed economic regulatory reforms are adopted ..., honest journalists like Schechter will be one of the main reasons. See this." "Schechter's new film, Plunder: The Crime of Our Time describes how Wall Street interests greased the skids for just such a collapse, consciously breaking laws they knew government regulators were unlikely to defend. Michael Moore has trod similar ground, but in a more overtly entertaining style. Schechter uses more traditional investigative procedures, by collecting evidence and interviewing perpetrators of financial crimes, journalists and government officials. It's a sobering documentary, but one that's too important to ignore." "A few years back, filmmaker Danny Schechter predicted the financial crisis in the United States before it actually happened. No one's laughing now. Perhaps, this is as good a reason as any to check out this new work from Schechter. 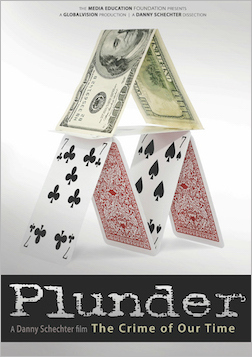 Plunder: The Crime of Our Time explores how the present-day crisis was built on a base of criminal activity. The journalistic filmmaker explores various shady enterprises and gives the viewer a clear-cut picture of how their actions lead to today's tragic situation." "Plunder: The Crime of Our Time is a great background documentary for those Americans who are so confused -- and who isn't -- by the terms used for exotic wall street financial instruments that they tune out. Schechter lays out in a straightforward fashion how the nation was taken to the cleaners by Wall Street and how they did it, complete with understandable diagrams and a clear, lucid script."